Remember when you were younger, when in the winter months you would all sit around the fireplace, hands in front, to get nice and warm? While standard radiators have all but replaced fireplaces, it can be rare to see a working fireplace in the modern home, but with fireplaces still being great for warmth, making a home look better, and being a great conversation piece to boot! It is a common misconception that people who live in flats or newer homes cannot have a fire, but nowadays, with the options available, this is simply not true! Since certain fires will only work with certain chimneys, you need to make sure that you have the right fire for the right chimney, below we will cover the potential options for each. Class 2 – Pre-Fabricated flue – This is most likely if your house was built after the 1960’s and has a metal flue pipe on your homes roof. This chimney type can be identified by a 5” (130 mm) diameter flue and a steel flue terminal. Pre-Cast Flue – This is common in many newer builds, where they may not have a chimney but have a pre-cast flue, identifiable by a rectangular box section tile itself being shallower when compared to a conventional flue. No Chimney or Flue – This means that, while you may not be able to have a traditional fireplace, you can still have a Balanced Flue gas fire (No chimney required) flue less gas or an electric fire in your home. Now you know the type of chimney you have, we can now cover the types of fire out there, to help you know which fire is best for your needs. 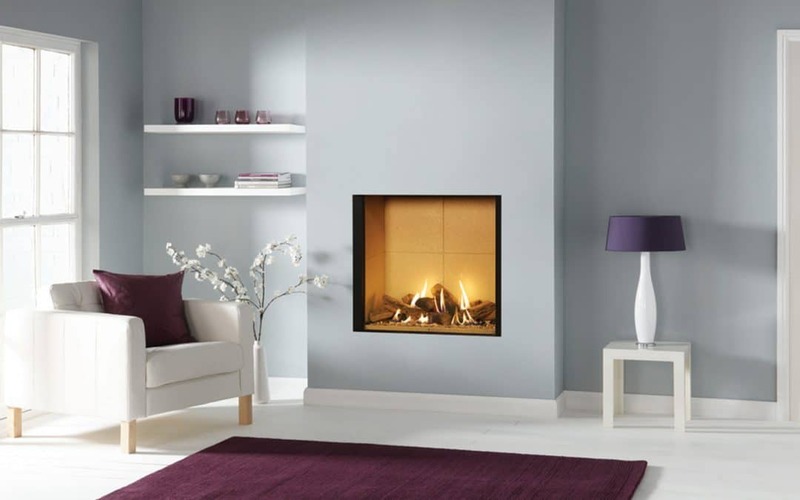 Gas fires are perfect for those who wants a clean and efficient way to bring instant heat to your home, with them combining the look or real flames with the ability to have instant heat and a controllable temperature. Gas fires are also the cheapest fire to run, and come in a wide range of styles for you to choose from, with some not requiring a flu or chimney, just a working gas supply. These do need to be installed by a gas safe engineer, so if you are looking for a gas safe engineer in Clacton, then why not give me a call! Electric fires allow for you to have decorative electric fire flames in your room, with or without heat. These work by heating an electric element and transfer heated air into the room while showing you different sorts of decorative flames. Essentially a mix of a radiator and a TV screen, but far more specialised. These are fairly easy to install as a rule, as a lot of them are just plug-and-play. The most traditional and potentially nostalgic fire. With solid fossil fuel fires being inefficient and not a eco-friendly solution to heating your home. We would recommend a wood burning or bio mass options for a solid fuel fire, with wood and bio mass being the carbon neutral choice but both giving off a lot of heat as well as looking great and being clean burning, efficient and available in a range of sizes and styles to improve your home. Now you should have everything you need to know to go out there and find the right fire for your home! Concerned that you need more help with your purchasing or looking for someone to help you install your fire? Then you’re in need of a gas engineer in Clacton! Why not give Heating & Plumbers – The leading Clacton boiler and fireplace installation service a call? You can give us a call on 01255 722 542 or send us an email on info@heatingandplumbers.com! We aim to respond to all enquiries within a working day of them being sent.